Six years ago, I began a project. 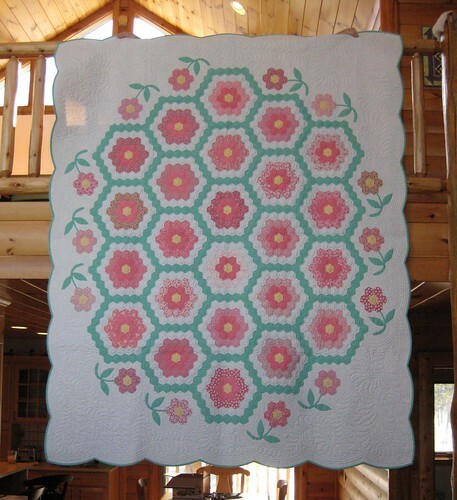 It was a Grandmother’s Flower Garden quilt with at least 2000 hexagons in it. I worked on this project at my bi-weekly quilting bee group. I jokingly called it my “Granddaughter’s Flower Garden.” You have to understand, I have only one daughter and she was not married, still a student at the time. There was no granddaughter anywhere in sight. However, I persisted and worked on the project intermittently, swearing never to hand piece anything ever again, not knowing if I would ever finish the project. Well, guess what? A couple of years ago daughter got married and this month she delivered a beautiful baby girl. I had fair warning early in her pregnancy, dragged that project out and, yes, I finished it! Yeah! See below. English paper pieced hexagons and “garden paths” in the center. 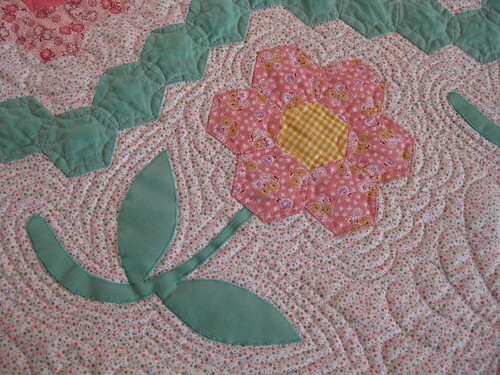 Little flowers made of hexagons and appliqued stems and leaves in the border. 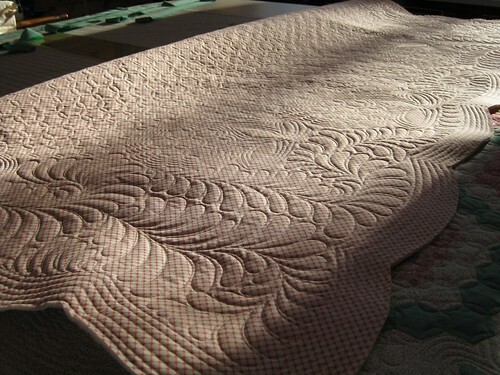 Machine quilting completed, front view. 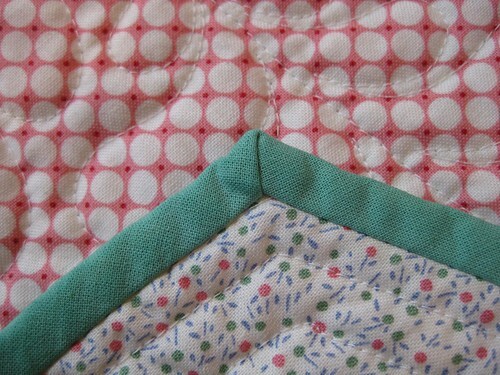 Machine quilting completed, back view. The completed quilt. Ta da! It’s absolutely beautiful. 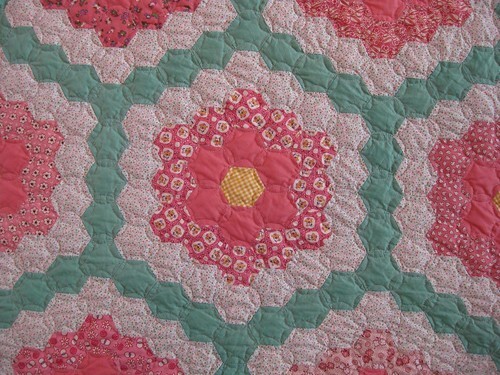 I love the applique and the scalloped border. Great job! Just when I think you can’t amaze many any more, you do! Absolutely marvelous. I can’t wait to see it in person. How you can change an ordinary design that I have seen many times….into a new design/masterpiece is a tribute to your amazing creativity. 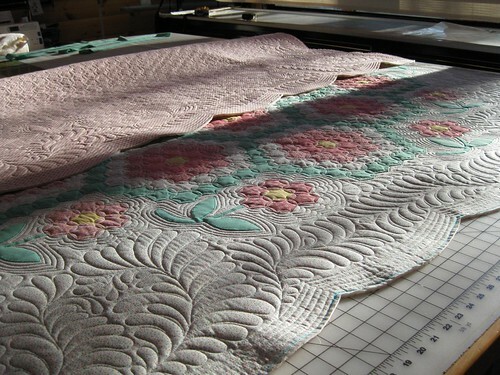 Adding the flowers, the quilting, the borders. Very very nice.